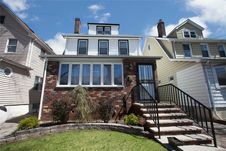 The details on 21-11 147th St: This house located in Northeastern Queens, New York, NY 11357 is currently for sale for $998,888. 21-11 147th St is a – square foot house with 4 beds and 1.5 baths that has been on Estately for 1 days. 21-11 147th St is in the Northeastern Queens neighborhood of New York and has a WalkScore® of 66, making it somewhat walkable. This house is in the attendance area of J.H.S. 185 Edward Bleeker, P.S. 079 Francis Lewis, Queens Academy High School, Flushing High School, Flushing International High School, East West School Of International Studies, Townsend Harris High School, Women's Academy Of Excellence, Archimedes Academy For Math, Science And Technology, and High School For Arts And Business. Listing Courtesy of: MLSLI and Keller Williams Rlty Landmark.